BAGHUZ, SYRIA—In an effort to track down and eliminate the last militant staking claim to a caliphate in the region, American-backed coalition forces confirmed Monday they were chasing a single remaining ISIS soldier around the ruins of a small village in Syria. “This cagey individual has been using all kinds of sneaky tricks to outwit us at every turn,” said U.S. Army Gen. Joseph Votel, who described an incident in which American troops pursuing the elusive jihadist with butterfly nets ran at full speed into a brick wall the man had cleverly painted to look just like an ISIS encampment. “At one point, he put on the uniform of a five-star American general, started ordering our troops around, and I’ll be damned if we didn’t do every silly thing he commanded us to. It was hours before we figured out what had happened. 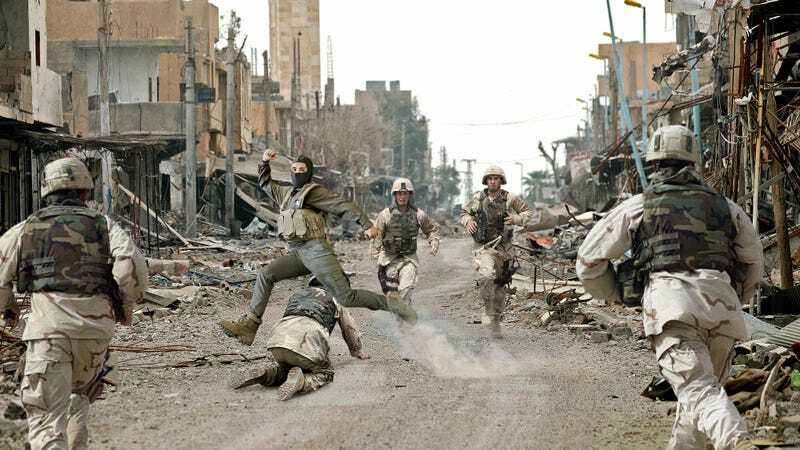 Despite deploying more troops, the last ISIS soldier constantly escapes every effort to capture him by relying on a number of spin moves and jukes. We’ll be looking for the guy and he’ll be right behind us pretending to help with the search. Morale has slipped significantly because he repeatedly humiliates the entire unit when he turns around to point and laugh at us. He’s just that good.” Votel stated that once this militant was captured, the coalition would only have to worry about the estimated 30,000 ISIS fighters in Syria and Iraq who have blended back into the general population and still carry out hundreds of attacks each year.